Where it will be installed. The material from which the pallet is made. What will be the sound when a jet of water hits it? Is it possible to make the pallet yourself. Let us dwell in more detail on each question. We want whether or not it is necessary to take into account the location of communications. 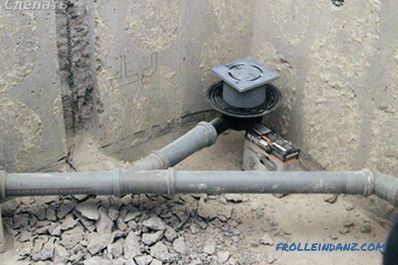 If with water pipes it is still possible to solve the problem, stretching them to the right place, hiding them in a wall, then with a sewer pipe these actions are not always acceptable. You will certainly need to take into account the angle of its inclination, otherwise problems can not be avoided. 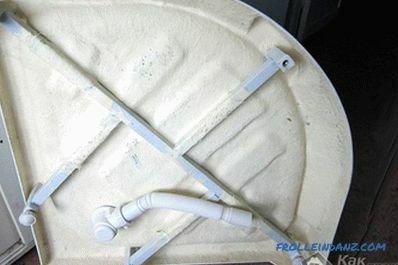 It is advisable to place the drain pan as close as possible to the main sewer pipe. Now that you know where exactly the pallet will stand, let's proceed to the next question. Bathroom sizes often do not give we have the opportunity for a large selection of pallet dimensions, but it is possible to change its depth without serious consequences. 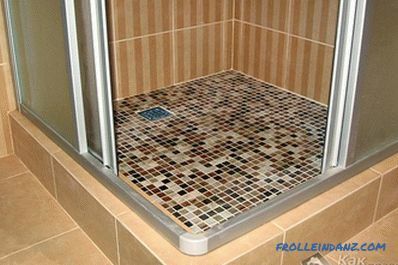 However, before choosing a shower tray, one should not forget about the overall height of the shower stall, if it is installed. A siphon will be installed under the pallet, which requires space not only for its installation, but also for maintenance. Imagine that the siphon is clogged, but in order to remove and clean it, you need to remove the pallet. It hardly seems convenient to you. nevertheless, there are pallets and with almost zero depth, because they are built flush with the floor. In general, with regard to the depth of the pallet, here each selects according to their needs. 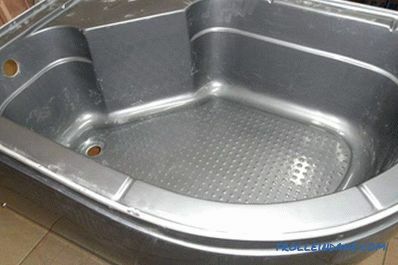 "If you are used to taking a shower often, but you cannot boast of excellent health, to get into a deep pan every time, then there is a fairly large selection of these products that have a shallow depth - from 4 cm. 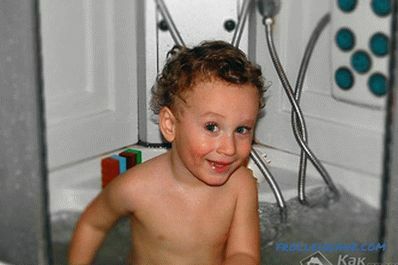 Another need for young parents having children who love splashing in water. In this case, you can choose a 30 cm high pallet. In addition, it is preferable to install deep models in old houses with “clogged” pipes, because if the water is drained slowly, then in a low pallet overflow ol across edges. The dimensions of the sides of the pallet can vary from 70 to 120 cm, although, if necessary, you can find instances and larger ones. Square, round or triangular? 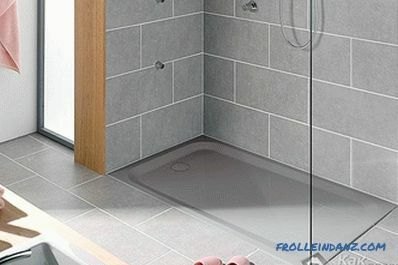 There is a wide variety of shower trays, but square, rectangular, triangular with a beveled or rounded corner are most in demand because it is possible to make the best use of the available space. The pallet should fit the place where it will be installed. 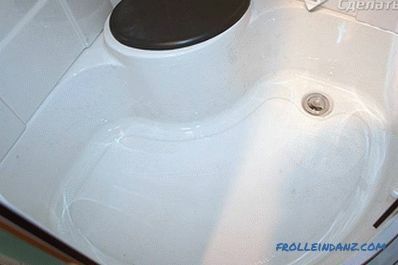 The best option for a small bathroom is to install it with a shower in one of the corners. 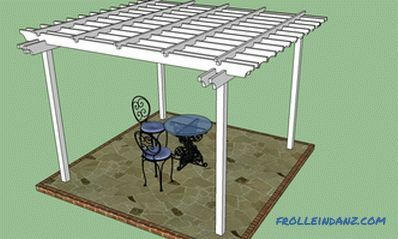 With this approach, a pallet that has at least two corners will be suitable. 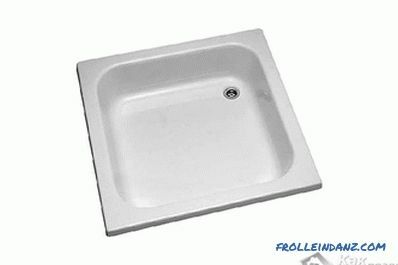 If the bathroom is large, then the choice is expanding, and you can choose the pallet of the most bizarre shape - round, semicircular, polygonal, angular, elliptical, and even twisted into a snail. 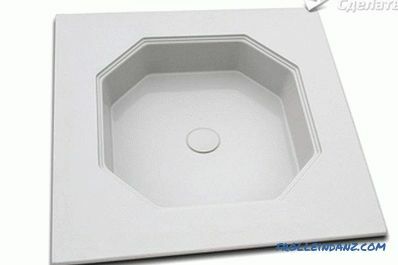 Acrylic trays are very popular because their distinctive feature is ease of care and practicality. Although such a surface can be easily damaged, it is nevertheless very easily restored. Although the thickness of the acrylic layer is only 4-6 mm, this does not prevent the pallet from being durable. 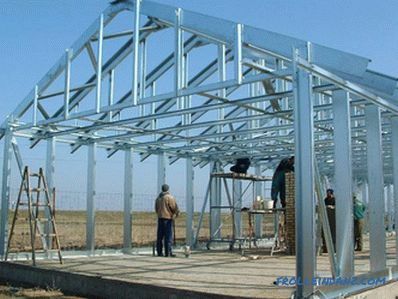 In order to strengthen the structure, in the lower part of the pallets are reinforced with metal, fiberglass or plastic. The undoubted advantage is the low weight of the structure. Enamelled steel trays are also quite are popular. 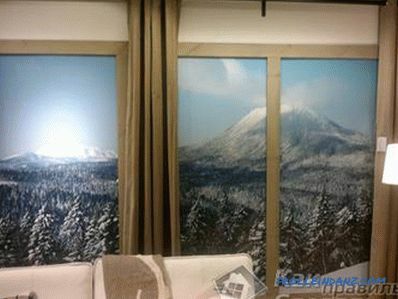 The demand for them is due to the fact that such pallets are heated quickly and are inexpensive. The steel pallets are very noisy, because when a water jet hits them, a roar sounds, and the thinner the metal used to make the pallet, the louder the sound. 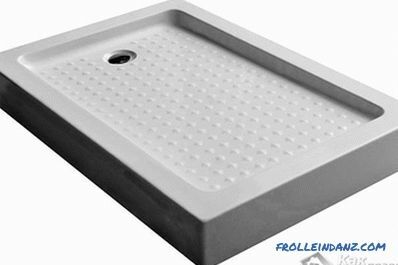 For the manufacture of such pallets used sanitary ware and sanfarfor.They are durable, easy to care for, but at the same time, this product has a very large mass and they are afraid of mechanical damage. The ceramics is cold, so before you stand on such a pallet, you need to heat it using hot water. Often there are "patterns" on the ceramic pallets - an anti-slip device. Made of This material pallets are only those firms that produce goods "premium". Do not confuse wooden pallets with wooden grids that are designed to protect against slipping. These pallets could be quite popular because it is very durable, practical and durable, but this did not happen because of their high cost. The disadvantages include the fact that such products are very heavy. In order not to slip in the shower, the bottom of the pan should not be slippery. 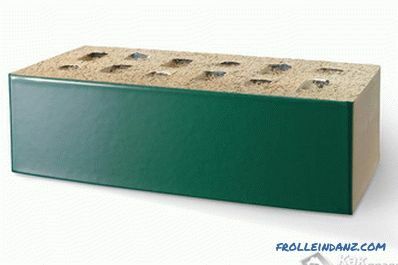 The best solution to this problem would be to purchase a pallet with a rough or grooved bottom. 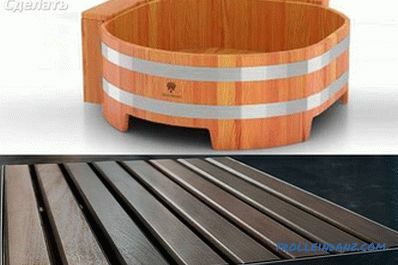 If you purchased a pallet with a smooth surface, then put a wooden grate or rubber mat in it. Work begins on a frozen concrete screed. The first step is to take care of draining the water. For this purpose, a drain neck and a discharge pipe are mounted, which are placed on supports from wooden chocks of different heights. 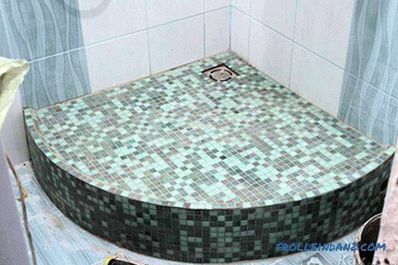 This is necessary in order to ensure the required slope of the drain pipes. 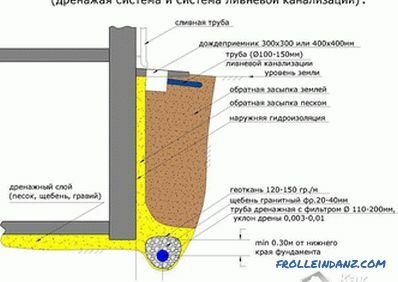 The water in the sewer pipe must go by gravity, therefore the pipe running from the pallet should be laid with a bias towards the main highway. It is important to provide more in the design. 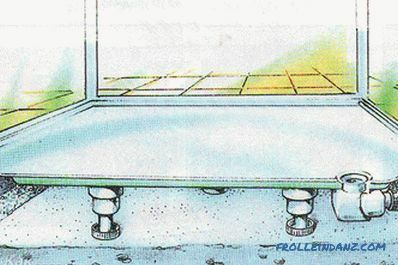 Concrete screed can only be made under the pallet. Now we make the walls of brick, apply several layers of plaster. If desired, the construction of walls can be made concrete, but for this you will need to make formwork, knead the concrete, and pour, which is not always convenient, especially in the apartment. Next you need to make a concrete screed on the bottom of the pallet with a mandatory bias towards the drain neck. 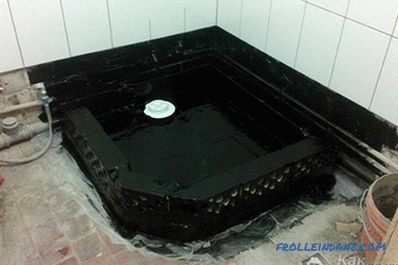 The screed must be made so that the drain hole is at the level of the laid ceramic tiles. out of a brick, ground the dried screed and the walls with a waterproofing compound. The final step will be laying the tiles. In this case, special mixtures will be required, as a simple glue-cement will not reliably keep the tile in a constant moisture. 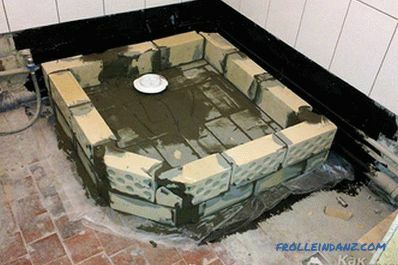 You will also need a special grout for joints. If the manufacturing technology of the pallet is not followed, there is a high probability of flooding the neighbors. From how seriously you approach the issue of choice and installation, depends not only the lifetime of the pallet, but also the convenience of using it. how to assemble the shower stall yourself. This movie shows how you can assemble and install a shower cabin yourself. The first part is devoted to the pallet.